The fifth in the series of the classic fantasy tales -- The Chronicles of Narnia. A complete and unabridged edition of this enduringly popular Children's book. A King and some unexpected companions embark on a voyage that will take them beyond all known lands. As they sail father and father from chartered waters, they will discover that their quest is more than they imagined and the the world's end is only the beginning. Stop it! cried Eustace. Its some silly trick you are playing! Ow! A great cold salt splash had broken right out of the frame and they were breathless from the smack of it, as well as being wet through. The Voyage of the "Dawn Treader" : Complete & Unabridged by C. S. Lewis was published by HarperCollins in October 2003 and is our 25320th best seller. The ISBN for The Voyage of the "Dawn Treader" : Complete & Unabridged is 9780007173013. 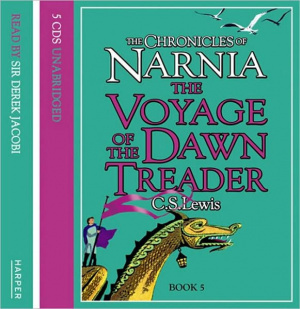 Be the first to review The Voyage of the "Dawn Treader" : Complete & Unabridged! Got a question? No problem! Just click here to ask us about The Voyage of the "Dawn Treader" : Complete & Unabridged.